This weekend my work on implementing NVIDIA global performance counters has been merged in Nouveau. With Linux 4.2, Nouveau will allow the userspace to monitor both compute and graphics (global) counters for Tesla, but only compute counters for Fermi. I need to go back to Windows for reverse engineering graphics counters with NVIDIA Perfkit. About Kepler, I have to figure out how to deal with clock gating but this is not going to be hard, so I’ll probably submit a series which adds compute counters this month. All of these performance counters will be exposed through the Gallium’s HUD and GL_AMD_performance_monitor once I have finished writing the code in mesa. But don’t be too excited for the moment, because we still need to implement the new nvif interface exposed by Nouveau in libdrm. My plan is to complete all of this work before the XDC 2015. I’ll talk again about the interface between the Linux kernel and the userspace (mesa). After few weeks of work, I now have a full implementation which exposes NVIDIA’s performance counters in Nouveau. I actually have two versions with different approachs. The first one is almost “all-userspace” which means that the configuration and the logic of performance counters are stored in the userspace, while the second one is almost “all-kernelspace” and only exposes what events can be monitored from the userspace. These two approachs use a set of software methods and the perfmon engine of Nouveau, initially written by Ben Skeggs, in order to set up performance counters. This post will only focus on global counters, please refer to my latest article about MP counters on nv50/Tesla if you are interested. Before we continue, let me recall what is a performance counter for NVIDIA. A hardware performance counter is a set of special registers which are used to store the counts of hardware-related activities. Hardware counters are oftenly used by developers to identify bottlenecks in their applications. PCOUNTER is the card unit which contains most of the performance counters. PCOUNTER is divided in 8 domains (or sets) on nv50/Tesla. Each domain has a different source clock and has 255+ input signals that can themselves be the output of one multiplexer. PCOUNTER uses global counters. 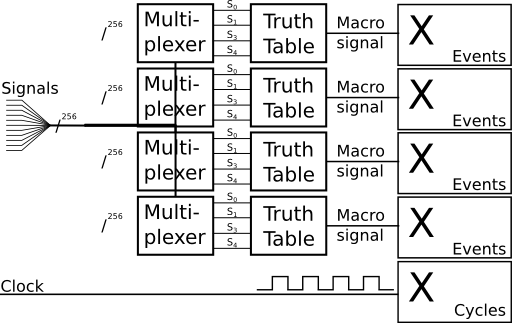 Counters do not sample one 8-bits signal, they sample a macro signal. A macro signal is the aggregation of 4 signals which have been combined using a function. An overview of this logic is represented by the figure below. Now, let me talk a bit about graphics counter exposed by NVIDIA on nv50/Tesla family. Graphics counter can be used to give detailled information for OpenGL/Direct3D applications. These performance counters are only exposed by NVIDIA PerfKit, an advanced software suite for profiling OpenCL and Direct3D/OpenGL applications on Windows (only). Last year, I reverse engineered most of these graphics counter. You can take a quick look at the documentation for nva3 (for example), this will introduce the notion of complex hardware events. The main goal of the interface between the kernel and mesa is to expose these complex hardware events to the userspace. The main idea of this interface is to store the configuration of complex hardware events inside mesa. In this approach, the kernel only knows the list of 8-bits signals and exposes them with a unique string identifier, for example, the signal 0xcb on nva3 is associated to ‘gr_idle’ on the set 1. Then, the userspace can build complex events and send the configuration to the kernel through an ioctl call which allocates a NOUVEAU_PERFCTR_CLASS object. A NOUVEAU_PERFCTR_CLASS object is used to init, poll and read performance counters. This interface is based on a set of softwared methods used to control performance counters. Basically, we first allocate a NOUVEAU_PERFCTR_CLASS object with the configuration (8-bits signal/function/mode …) of the counter. Then, before a frame is rendering (using the begin_query() hook of gallium) we send the handle of this object with a software method to start monitoring. At this time, the configuration is written to PCOUNTER and the counter starts to count hardware related activities. After the frame, we send a sequence number with an another software method to read out values using a notify buffer object which is allocated along the current channel. If you are interested, a previous post gives more details about that interface. With this “all-userspace” approach, the kernel is not able to monitor complex hardware events because the configuration and the logic is stored in the userspace. Actually, the configuration is shared between the kernel and mesa. The kernel only knows 8-bits signals while the userspace knows the configuration of hardware events. Perf also called perf_events, is a kernel-based interface for profiling Linux which is able to monitor performance counters like the number of instructions executed. Thus, if the configuration of hardware events is stored in the userspace, this will be a problem for exposing them in perf because we don’t want to duplicate the configuration. I also talked with Daniel Vetter, the maintener of the i965 driver and the responsible of the major part of DRM, and he seems to be agree with the idea that it could be good to expose hardware events in perf. We also have an another problem related to muxs because the userspace knows the configuration while the kernel does not. So, the kernel has to check address of muxs in order to avoid security issues. The last problem is that the interface is closely based on the perfmon engine, so if perfmon changes in the future, this will require to add a new interface. But, we don’t want to add another driver private ioctl or design a new interface in case of perfmon must be evolved in the future. However, with the “all-kernelspace” approach we don’t have this problem since the kernel knows the logic and only exposes a list of monitorable events. However, the “all-userspace” approach has the advantages to reduce the amount of code in the kernel and to facilitate the configuration of counters since all the logic is located in the userspace. This interface is kernel-based like Perf. The configuration and the logic (except multi-pass events which need two frames) are stored in the kernel only. The kernel exposes a list of monitorable events. Thus, the userspace just has to allocate a NOUVEAU_PERFEVENT_CLASS used to init, read and poll complex hardware events. Like the previous interface, this is one is also based on a set of software methods used to control performance counters. The behaviour is almost the same than before except that we allocate a NOUVEAU_PERFEVENT_CLASS object which represents a complex hardware event instead of a NOUVEAU_PERFCTR_CLASS. With this approach it’s easy to monitor complex hardware events inside Nouveau and to expose them to Perf in the future. Also, there is no security issues because muxs are configured from and by the kernel, we don’t have to check their address. Since, the kernel only exposes a list of events and stores the configuration, pefmon can change without any impacts to the interface between the kernel and the userspace in the future. Basically, the userspace only knows the name of events, and some flags used to do scheduling. However, it’s hard to expose to the userspace what events are monitorable simultaneously or not. On nv50/Tesla, we have 8 domains (or sets) and 4 counters per domain. Thus, if all complex events only use one counter per domain, we can monitor 32 events simultaneously. Good! But actually not… Because some events use 2 counters per domain. To handle this case, the userspace can retrieve the number of available domains and the number of counters per domain through an ioctl call. Then, we expose the domain ID and the number of counters needed by an event. With this information, we can schedule events from the userspace. But we still have one problem, how to handle the case where two events on the same domain share a mux? Some events are multiplexed but two or more events can use the same mux with a different value. To handle this special case, we expose conflicts to the userspace using some 64 bits flags. Thus, the userspace just has to do a AND comparison to check if two events can be monitored simultaneously. These two interfaces have different pros and cons, but in my opinion, I think the “all-kernelspace” is more elegant and more future-proof since we can monitor complex hardware events inside Nouveau and expose them to perf (Linux) . To sum up, we still have to choose one version of the interface between the kernel and mesa. I’ll talk about this with Ben Skeggs, the maintener of Nouveau to get his opinion. We hope to get the code upstream in september or october, and before Linux 3.19. As part of my Google Summer of Code project I implemented MP counters (for compute only) on nv50/tesla. This work follows the implementation of MP counters for nvc0/fermi I did the last year. Compute counters are used by OpenCL while graphics counters are used to count hardware-related activities of OpenGL applications. The distinction between these two types of counters made by NVIDIA is arbitrary and won’t be present in my implementation. That’s why compute counters can also be used to give detailed information of OpenGL applications like the number of instructions processed per frame or the number of launched warps. MP performance counters are local and per-context while performance counters, programmed through the PCOUNTER engine, are global. A MP counter is more accurate than a global counter because it counts hardware-related activities for each context separately while a global counter reports activities regardless of the context that generates it. All of these MP counters have been reverse engineered using CUPTI, the NVIDIA CUDA profiling tools interface which only exposes compute counters. On nv50/tesla, CUPTI exposes 13 performance counters like instructions or warp_serialize. The nv50 family has 4 MP counters per TPC (Texture Processing Cluster). Currently, this prototype implements an interface between the kernel and mesa which exposes these MP performance counters to the user through the Gallium HUD. Basically, this interface can configure and poll a counter using the push buffer and a set of software methods. To configure a MP counter we use the command stream like the blob does. We have two methods, the first one is for configuring the counter (mode, signal, unit and logic operation) and the second one is just used to reinitialize the counter. Then, to select the group of the MP counter we have added a software method. To poll counters we use a notifier buffer object which is allocated along a channel. This notifier allows to communicate between the kernel and mesa. This approach has already been explained in my latest article. To sum up, this prototype adds support for 13 performance counters on nv50/tesla. All of the code is available on my github account. If you are interested, you can take a look at the mesa and the nouveau code. Follow up on this year’s GSoC, it’s time to talk about the interface between the kernel and the userspace (mesa). Basically, the idea is to tell the kernel to monitor signal X and read back results from mesa. At the end of this project, almost-all the graphics counters for GeForce 8, 9 and 2XX (nv50/Tesla) will be exposed and this interface should be almost compatible with Fermi and Kepler. Some MP counters which still have to be reverse engineered will be added later. To implement this interface between the Linux kernel and mesa, we can use ioctl calls or software methods. Let me first talk a bit about them. Currently, I have a first prototype of that interface using a set of software methods to get the advantage of the synchronization along the command stream, but also because ioctl calls are harder to implement and to maintain in the future. However, since a software method is invoked within an interrupt context we have to limit as much as possible the number of instructions needed to complete the task processed by it and it’s absolutely forbidden to do a sleep call for example. Basically that interface, like the NVPerfKit’s, must be able to export a list of available hardware events, add or remove a counter, sample a counter, expose its value to the userspace and synchronize the different queries which will send by the userspace to the kernel. All of these operations are sent through a set of software methods. To configure a counter we will use a software method which is still not currently defined, but since we can send 32 bits of data along with it, it’s sufficient to identify a counter. For this, we can send the global ID of the counter or to allocate an object which represents a counter from the userspace and send its handle with that sw method. Then, the kernel pushes that counter in a staging area waiting for the next batch of counters or for the sample command. This command can be invoked successively to add several counters. Once all counters added by the user are known by the kernel it’s the time to send the sample command. It’s also possible to synchronization the configuration with the beginning and the end of a frame using software methods. This command also uses a software method which just tells the kernel to start monitoring. At this time, the kernel is configuring counters (ie. write values to a set of special registers), reading and storing their values, including the number of cycles processed which may be used by the userspace to compute a ratio. Currently, we can configure and sample a counter but the result of this counting period is not yet exposed to the userspace. Basically, to be able to send results from the kernel to mesa we use a notifier buffer object which is dedicated to the communication from the kernelspace to the userspace. A notifier BO is allocated and mapped along a channel, so it can be accessible both by the kernel and the userspace. When mesa creates a channel, this special BO is automatically allocated by the kernel, then we just have to map it. At this time, the kernel can write results to this BO, and the userspace can read back from it. The result of a counting period is copied by the kernel to this notifier BO from an other software method which is also used in order to synchronize queries. To synchronize queries we use a different sequence ID (like a fence) for each query we send to the kernel space. When the user wants to read out result it sends a query ID through a software method. Then this method does the read out, copies the counter’s value to the notifier BO and the sequence number at the offset 0. Also, we use a ringbuffer in the notify BO to store the list of counter ID, cycles and the counter’s value. This ringbuffer is a nice way to avoid stalling the command submission and is a good fit for the gallium HUD which queues up to 8 frames before having to read back the counters. As for the HUD, this ringbuffer stores the result of the N previous readouts. Since the offset 0 stores the latest sequence ID, we can easily check if the result is available in the ringbuffer. To check the result, we can do a busy waiting until the query we want to get it’s available in the ringbuffer or we can check if the result of that query has not been overwrittne by a newer one. To sum up, almost all of these software methods use the perfmon engine initially written by Ben Skeggs. However, to support complex hardware events like special counter modes and multiple passes I still had to improve it. Currently, the connection between these software methods and perfmon is in a work in progress state. I will try to complete this task as soon as possible to provide a full implementation. I already have a set of patches in a Request For Comments state for perfmon and the software methods interface on my github account, you can take a look at them here. I also have an example out-of-mesa, initially written by Martin Peres, which shows how to use that first protoype (link). Two days ago, Ben Skeggs made good suggestions that I am currently investigating. Will get back to you on them when I’m done experimenting with them. See you soon for the full implementation! NVIDIA NVPerfKit is a suite of performance tools to help developpers in identifying the performance bottleneck of OpenGL and Direct3D applications. It allows you to monitor hardware performance counters which are used to store the counts of hardware-related activities from the GPU itself. These performance counters (called “graphics counters” by NVIDIA) are usually used by developers to identify bottlenecks in their applications, like “how the gpu is busy?” or “how many triangles have been drawn in the current frame?” and so on. But, NVPerfKit is only available on Windows. This year, my Google Summer of Code project is to expose NVIDIA’s graphics counter to help Linux/Nouveau developpers in improving their OpenGL applications. At the end of this summer, this project aims to offer a Linux version of NVPerfkit for NVIDIA’s graphics cards (only GeForce 8, 9 and 2XX in a first time) . To expose these hardware events to the userspace, we have to write an interface between the Linux kernel and mesa. Basically, the idea is to tell to the kernel to monitor signal X and read back results from the userspace (i.e. mesa). However, before writing that interface we have to study the behaviours of NVPerfKit on Windows. In a first time, let me explain (again) what is really a hardware performance counter. A hardware performance counter is a set of special registers used to count hardware-relatd activities. There are two type of counters, global counters from PCOUNTER and (local) MP counters. PCOUNTER is the card unit which contains most of the performance counters. PCOUNTER is divided in 8 domains (or sets) on nv50/Tesla. Each domain has a different source clock and has 255+ input signals that can themselves be the output of one multiplexer. PCOUNTER uses global counters whereas MP counters are per-app and context switched. Actually, these two types of counters are not really independent and may share some configuration parts, for example, the output of a signal multiplexer. On Tesla/nv50, it is possible to monitor 4 macro signals concurrently per domain. A macro signal is the aggregation of 4 signals which have been combined with a function. In this post, we are only focusing on global counters. Now, the question is how NVPerfKit monitors these global performance counters ? Case #1 : How NVPerfKit handles multiple apps being monitored concurrently ? NVIDIA does not handle this case at all, and the behaviour is thus undefined when more than one application is monitoring performance counters at the same time. Then, because of the issue of shared configuration of global counters (PCOUNTER) and local counters (MP counters), I think it’s a bad idea to allow monitoring multiple applications concurrently. To solve this problem, I suggest, at first, to use a global lock for allowing only one application at a time and for simplifying the implementation. Case #2 : How NVPerfKit handles only one counter per domain ? This is the simplest case, and there are no particular requirements. Case #3 : How NVPerfKit handles multiple counters per domain ? NVPerfKit uses a round robin mode, then it still monitors only one counter per domain and it switches the current counter after each frame. Case #4 : How NVPerfKit handles multiple counters on different domains ? No problem here, NVPerfKit is able to monitor multiple counters on different domains (each domain having up to one event to monitor). To sum up, NVPerfKit always uses a round robin mode when it has to monitor more than one hw event on the same domain. All of the software/driver counters represent a per frame accounting. These counters are accumulated and updated in the driver per frame, so even if you sample at a sub-frame rate frequency, the software counters will hold the same data (from the previous frame) until the end of the current frame. This article should have been published the last month, but during this time I worked on the prototype’s definition and its implementation. Currently, I have a first prototype which works quite well, I’ll submit it the next week. GSoC 2014 – The clock is again ticking! The Google Summer of Code 2014 coding period starts tomorrow. This year, my project is to expose NVIDIA’s GPU graphics counter to the userspace through mesa. This idea follows my previous Google Summer of Code which was mainly focused on reverse engineering NVIDIA’s performance counters. The main goal of this project is to help Linux developpers in identifying the performance bottleneck of OpenGL applications. At the end of this GSoC, NVIDIA’s GPU graphics counter for GeForce 8, 9 and 2XX (nv50/tesla) will (almost-all) be exposed for Nouveau. Some counters won’t be available until the compute support (ie. the ability to launch kernels) for nv50 is not implemented. During the past weeks, I continued to reverse engineering NVIDIA’s graphics counter for nv50 until now. Currently, the documentation is almost complete (except for aa, ac and af because I don’t have them), and recently I started this process for nvc0 cards. At the moment this documentation hasn’t been pushed to envytools and it is only available in my personal repository. For checking the reverse engineered configuration of the performance counters, I developed a modified version of OGLPerfHarness (the OpenGL sample code of NVPerfKit). 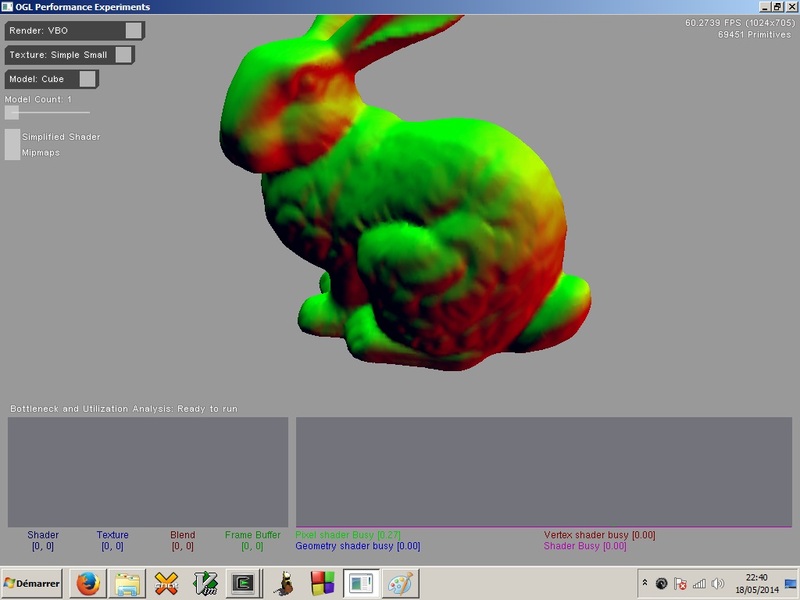 This OpenGL sample automatically monitors and exports values of performance counters by using NVPerfSDK on Windows. The figure below shows an example. All stats produced by the OpenGL sample are available in my repo. However, I didn’t publish the code because I don’t have the right to redistribute it, but I can send a patch if anyone is interested. For checking the configuration of these performance counters on Nouveau, I ported my tool to Linux. Then, I was able to compare values exported from Windows using nv_perfmon for monitoring counters. Now, the plan for the next weeks is to work on the kernel ioctls interface.